LAKE COUNTY, Ind. 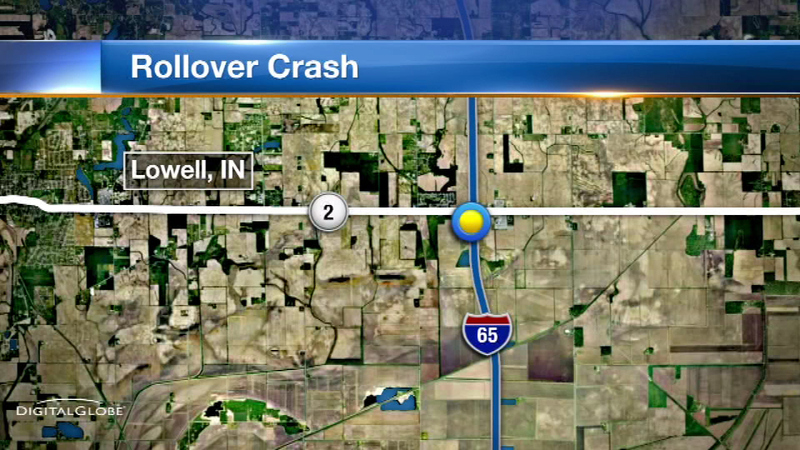 (WLS) -- A pickup truck carrying six family members crashed Sunday afternoon in northeast Indiana. The truck blew a tire on northbound I-65 about three miles north of the Lowell exit around 12:30 p.m. Sunday. This caused the pickup to go off the road and begin to roll. The trailer became unhitched from the pickup and went down the grassy embankment where it overturned and came to rest in the trees. The pickup also rolled as it went down the grassy embankment and came to rest on the passenger side up against the trees. Indiana State Police say everyone was wearing seat belts, which likely prevented serious injuries.